TFI Envision joins Skip the Plastic | TFI Envision, Inc.
Norwalk, CT — DID YOU KNOW: After being used for about 20 minutes, a plastic straw will take up to 200 YEARS to decompose in our oceans and landfills. 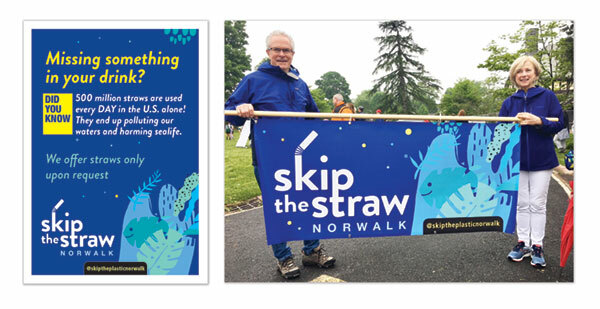 TFI Envision has joined the local movement of Skip the Plastic Norwalk and donated its creative services to developing logos for both Skip the Plastic and Skip the Straw, banners, informational cards for restaurants, post cards, ads, social media image posts and more. “Being in a shoreline community like Norwalk, we are particularly aware of the effects of plastics and other waste products polluting the waters. When we were asked to help, we welcomed the opportunity to help this grassroots group.” said Mary Ellen Butkus, Vice President of TFI Envision, Inc.